This is my third summer with bees. The first entire season is about building up the hive. 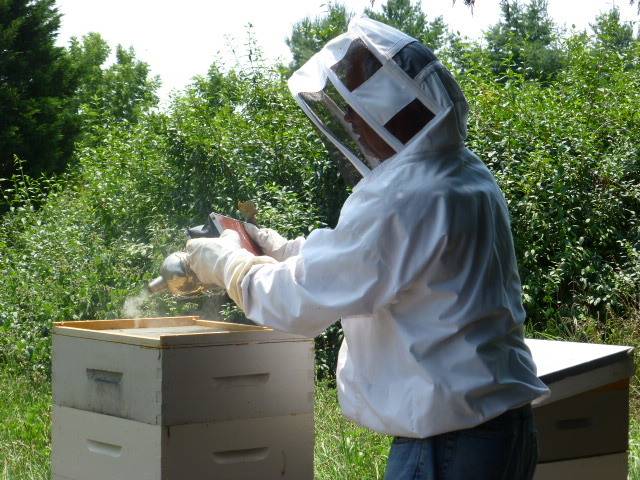 I fed the bees constantly and my two hives slowly built up combed frames, lots of brood (new bees), and honey for the winter, but there was never a plan to harvest honey. Last year I really didn’t know what to expect, but I got about 36 pounds and I was excited about it. I had higher hopes for this season, but I still only had one hive coming through the winter. 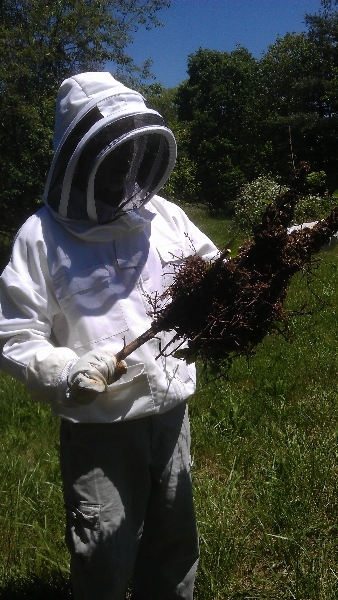 I added a package (hive #2), and then caught my own swarm – what I call an automated split. 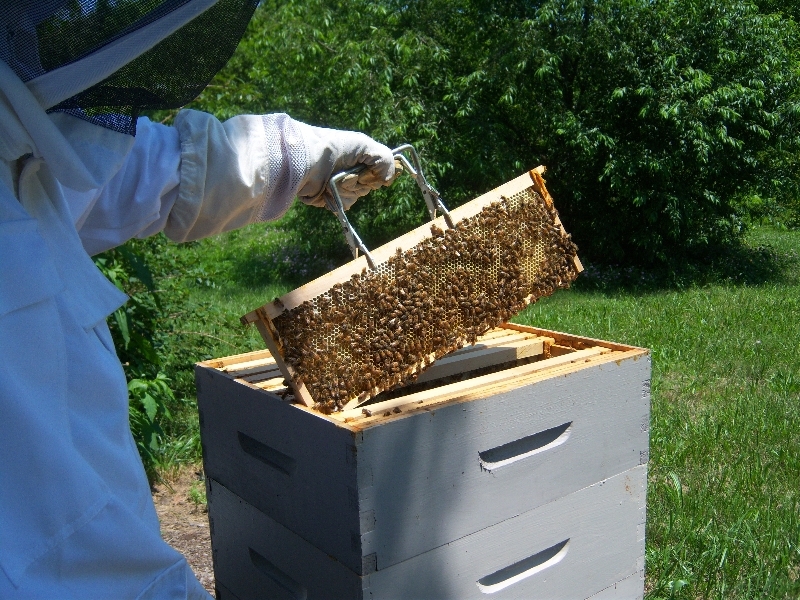 The package did very well in terms of population and hive building, but the splitting of the other hive diluted the efforts of that hive to generate honey. 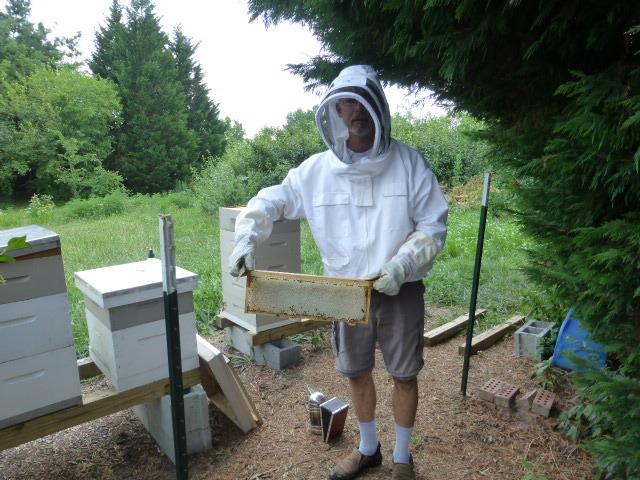 The package and the swarm hive both started with frames of comb and honey, so that helps kick-start their efforts, but I knew harvestable honey would be scarce. 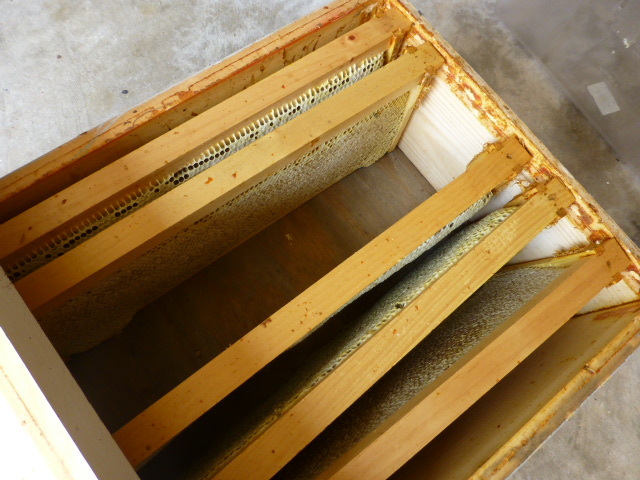 Up until two weeks ago I still had very few fully capped frames of honey (if any) despite having five honey supers on the three hives. 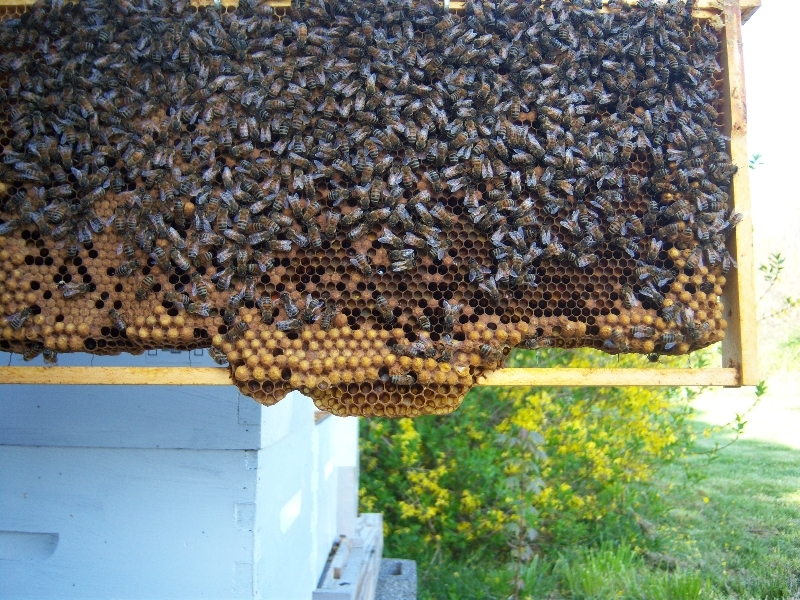 It was looking pretty bad for harvesting, but in the last couple of weeks they managed to find a little more nectar and cap off a bunch of frames. The prior week was very hot and dry which meant that the bees were out every day, but also might have meant that nectar could be hard to come by. Maybe wishful thinking works because the last two weeks made the difference between some honey and almost none. 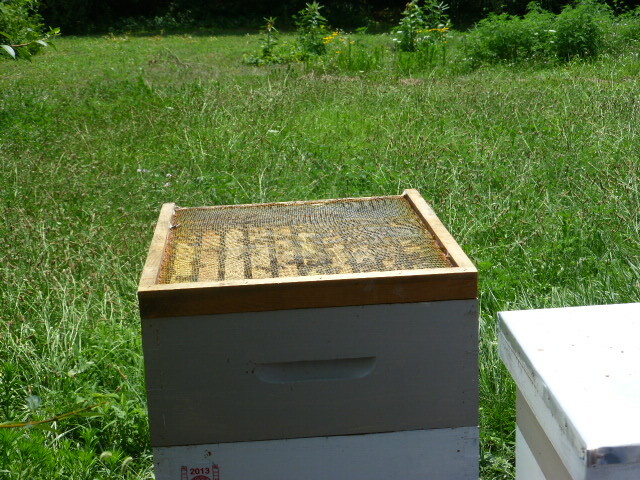 It is not unusual to have a hive that will produce two full boxes of capped honey. 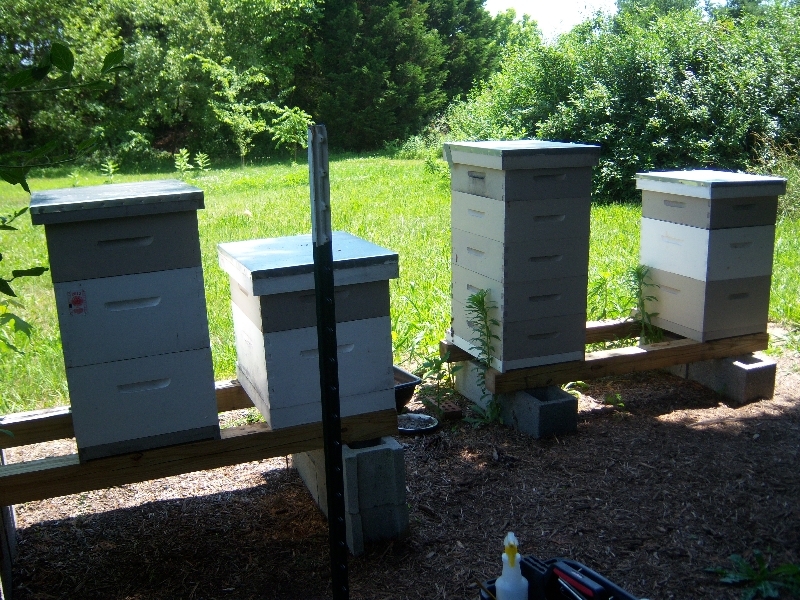 Medium frames that I use for honey supers will weigh about 3 1/3 to 3 1/2 pounds per frame. 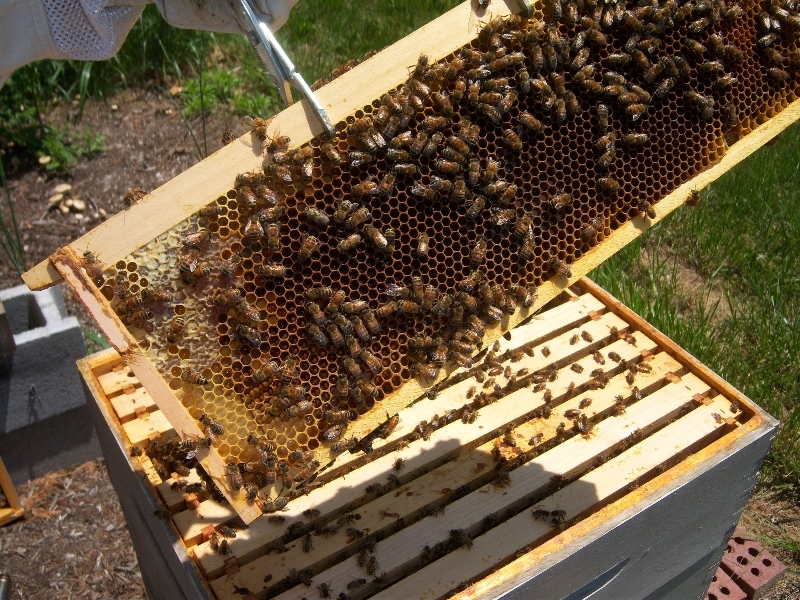 Twenty frames would yield about 67 pounds of honey. 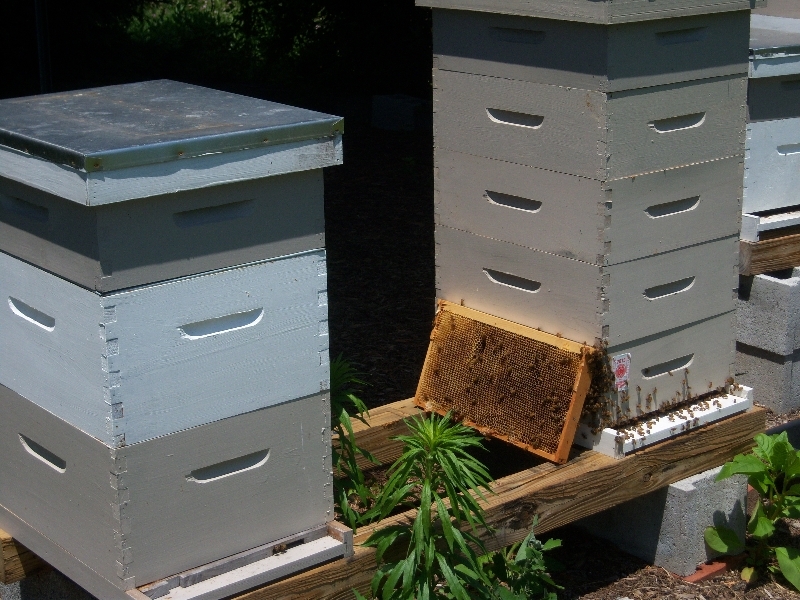 Two such hives could produce over 130 pounds. Maybe one year I will get lucky, but in the meantime, I just hope that I get something every year. 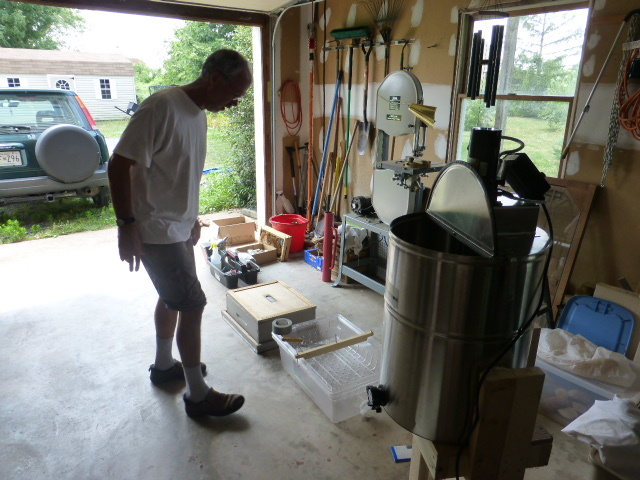 I was able to extract the honey from 12 frames and got 40 pounds. Johanna and Justin came out and helped. We all suited up and everybody helped with the various jobs including taking a few pictures. No one was stung. The bees were very cooperative. We worked for about four or five hours in some hot weather, but it was satisfying to see the bucket fulling up. It has been five days and the honey is still ‘resting’ in the bucket, but I should start to think about filling jars. I don’t have enough to sell again this year, but there should be enough for holiday gifts and personal consumption. I still have three jars left from last year, so that worked out about right. 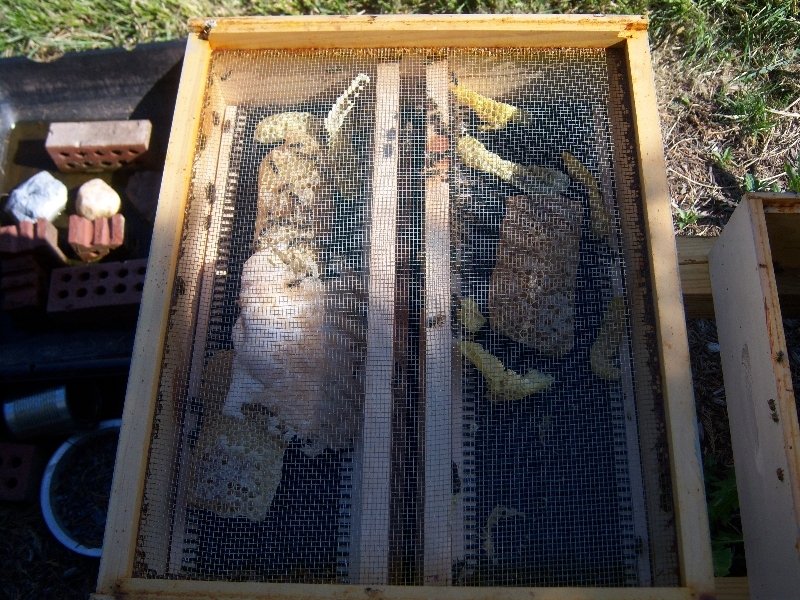 The leftover wax cappings can be given back to the bees and they will get all the remaining honey left. It only takes a few hours and the wax is pretty clean and dry and can be collected for a future use. 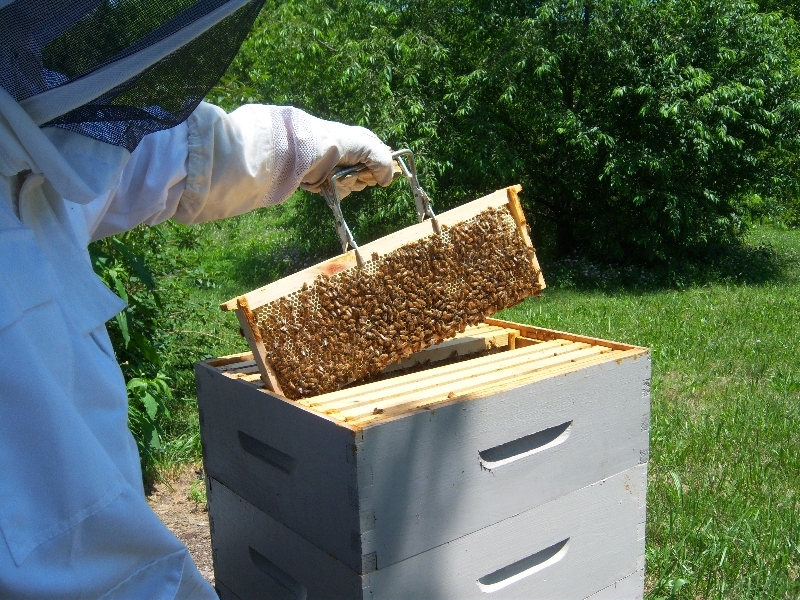 The rest of the season is about keeping the bees healthy and feeding a little and providing some pollen substitute patties so the queen will keep laying and go into the winter with a strong bunch of over-wintering bees. The baby ducks are almost full size now. We moved DeeDee next door so Deuce wouldn’t be so lonely, but she continues to be concerned for the babies. The babies are starting to grow into their voices at six-weeks of age, but still no clues that I know about as to which ones are hens and which one drakes. Voice changes occur soon, I think, but changes in plumage won’t show up until around 12 weeks. Very cute, either way. Yesterday I went to let the chickens out of the palace and I brought my phone/camera. The palace is currently home for 24 birds. The spring nectar flow is slowing down. I was told recently that the Tulip Poplar trees are just starting to bloom. This seems late, but I hope it is true. I don’t have any near me, so I haven’t see any blossoms firsthand but this would mean that there is a second big flow about to start. My clover is still doing great. I have been cutting my lawn in small sections in order to keep some clover available. I haven’t seen very many bees on it, though, so I am guessing that they are still finding sources of nectar elsewhere. 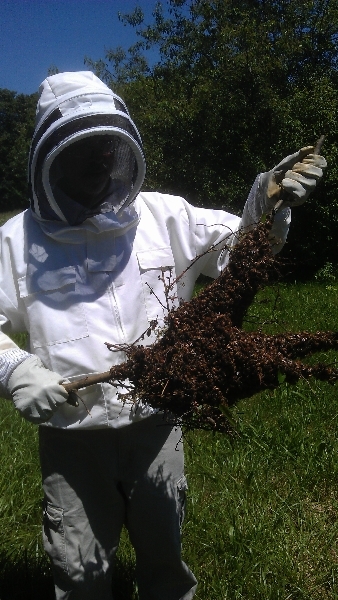 My package hive is going gangbusters. 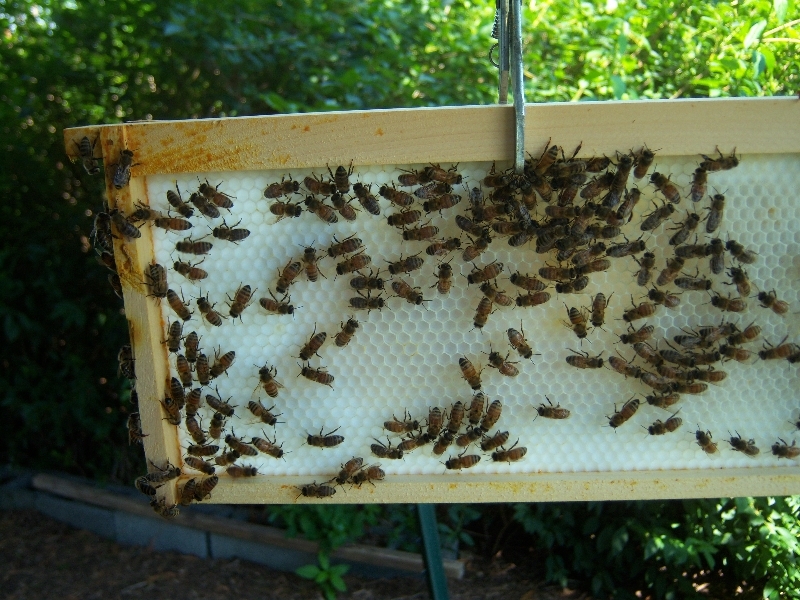 It has three mediums for brood and two honey supers and when I pull off the outer cover, all I see is bees through the screened inner cover. I can barely see any wood. I was a little worried about swarming, but I looked yesterday and found that none of the frames are capped and there is one or two that still need wax drawn. So I am hoping that the bees don’t sense that they are out of space. I generally don’t tear down to the bottom box when inspecting. I just try to look into the top of the brood box to see if all is well. I fear that the bottom brood box might be largely empty. I don’t have a queen excluder on this hive, so it is possible that the brood has moved up into boxes two and three and possibly four. If that has happened, then I might not end up with two supers of honey. Common wisdom is that the nectar flow is about finished at this time of year, but I am hoping that the summer is as delayed as the spring was. 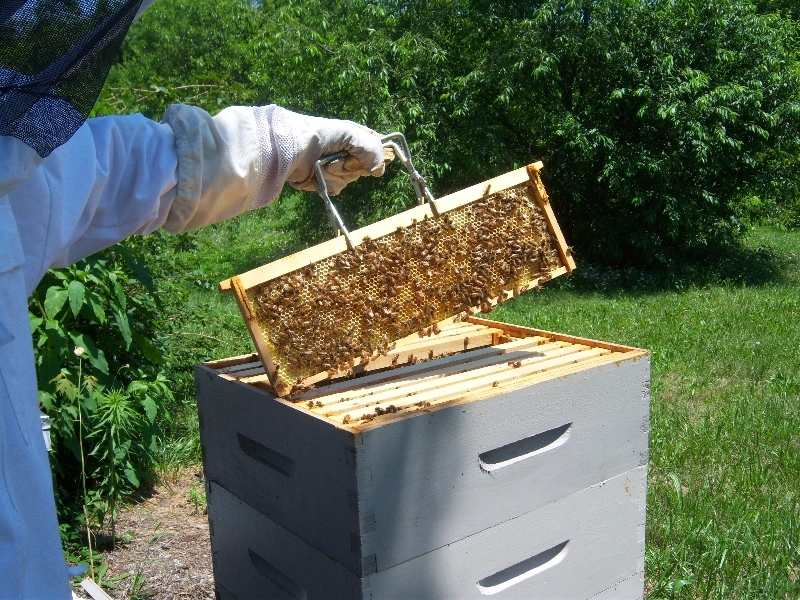 If the nectar is finished, then I will end up with the same situation as last year – that is, thirty or forty pounds of uncapped or partially capped frames. 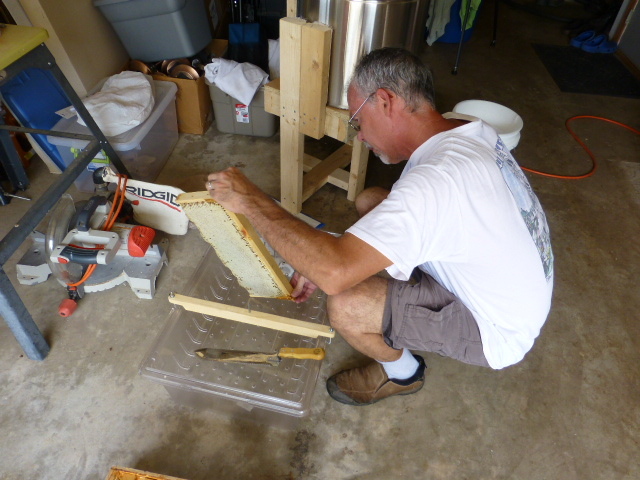 I need to figure out how to concentrate the bees efforts to finish capping the honey. 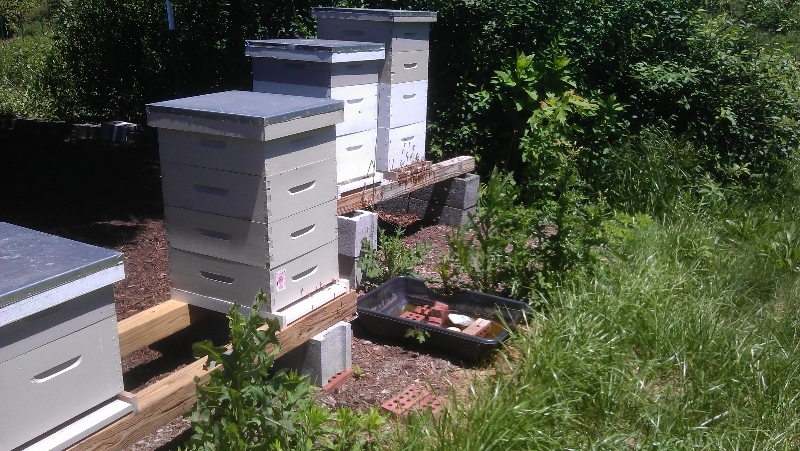 The dilemma seems to be that if I don’t put extra supers on soon enough, the bees will swarm, but if I put the boxes on too soon, the bees don’t cap those frames and just start filling the new frames. I end up with the same amount of weight, but instead of 10 frames of capped honey, I end up with 20 frames of partially capped honey/nectar. 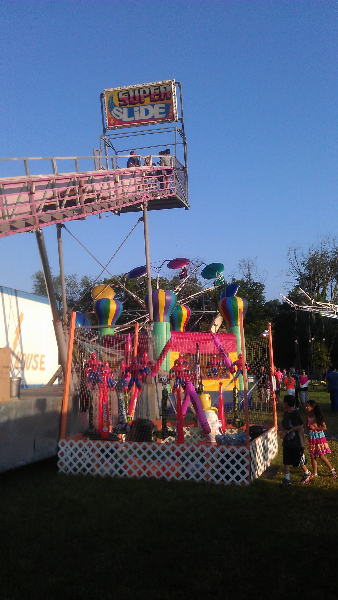 Last weekend we went to the Woodsboro carnival. 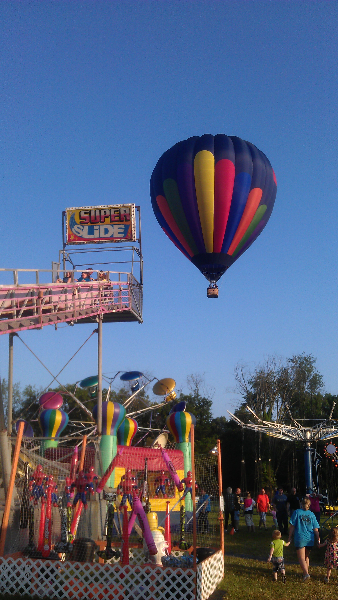 There are a lot of these small town fairs during the summer. There is one in Libertytown coming up, and a slightly larger one in Thurmont later this summer. There is the Maryland State fair at the Timonium fair grounds in late august I think and of course there is the Great Frederick Fair in Sept. It seems odd that there would be a county fair after the state fair, but that is partially because the state fair is not such a big deal here in Maryland. 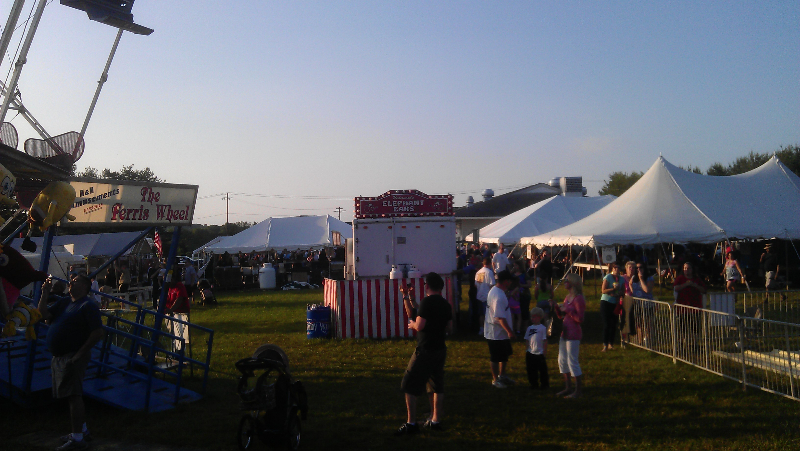 The county fairs are more relavent to the locals and sometimes even bigger events. I had 20-30 frames of partially capped honey going into the winter and came out with about the same number. First of all, I had five hives at the peak of summer, but four of them died out by December. So I had way more partially full medium frames than I could use. 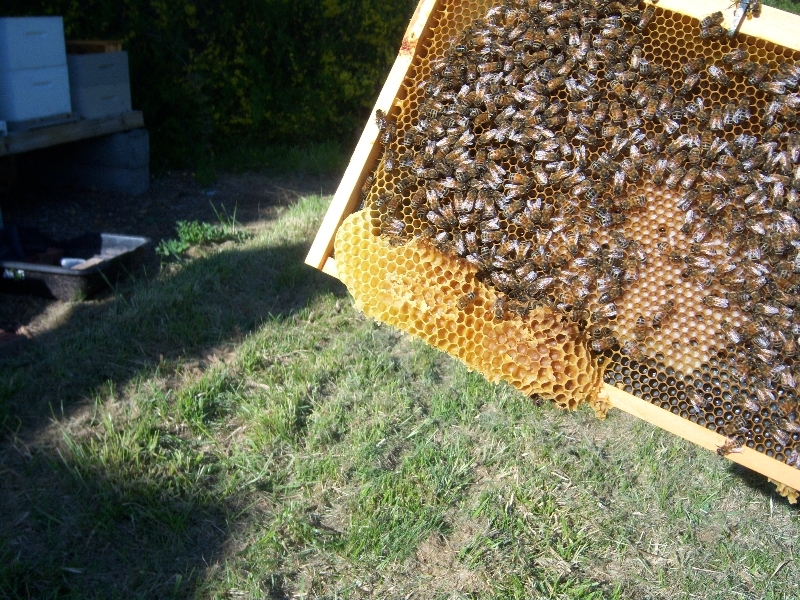 I gave the one strong hive a full super of the excess frames, but still had 20 or so left over. 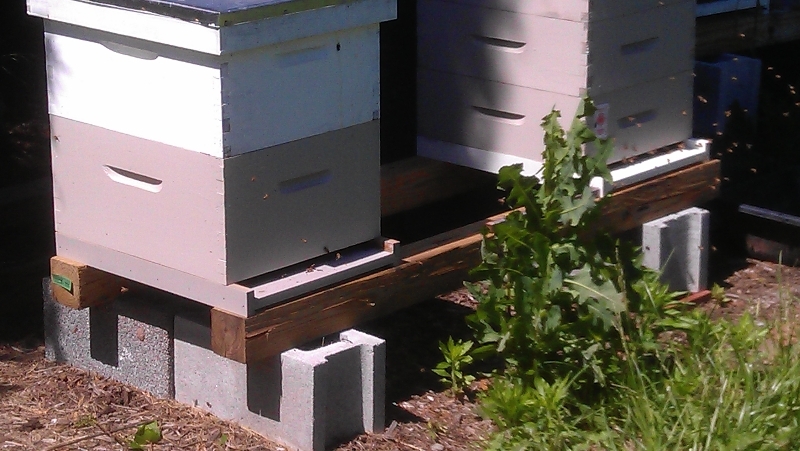 Most of those stayed in bee-less hives over the winter. 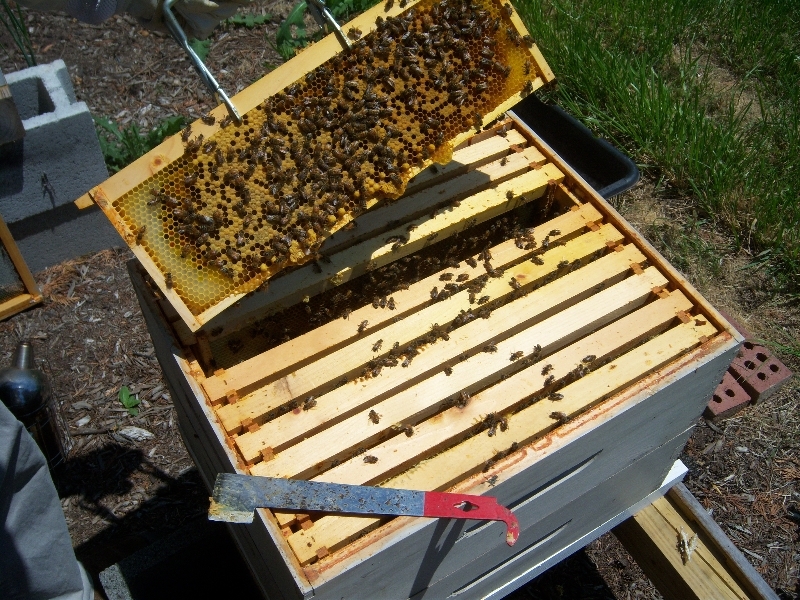 The live hive didn’t eat much if any of the honey in the super, so by late winter I still had most of the 20-plus frames. Even in the early spring, they bees didn’t seem very interested in eating from the super. I didn’t feed at all. 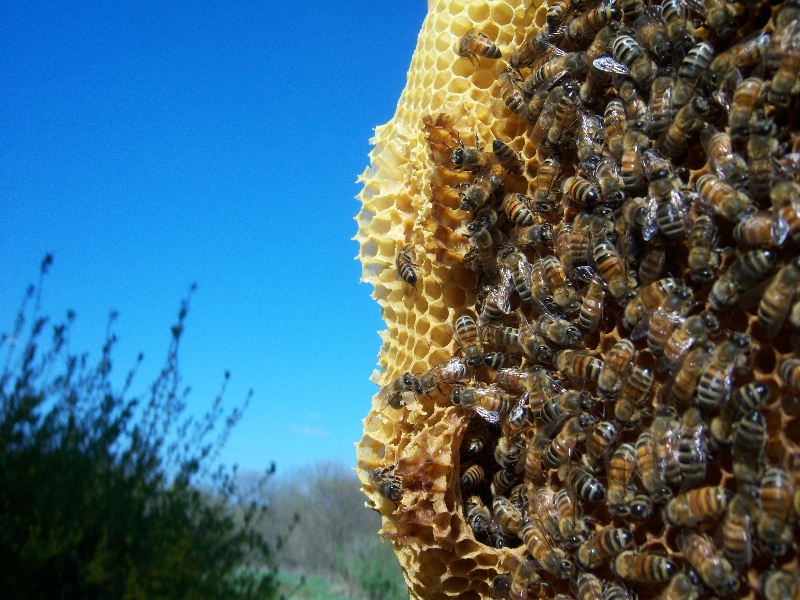 I installed a package in early spring and gave them some of the excess frames, but even they seemed more interested in foraging for early nectar. Finally, a week or two ago, I decided that I would try to offer these partially full frames to the bees again, now for the two hives. The nectar flow is slowing down now, so I had hopes that they would still be in the gathering mode. This time it worked. 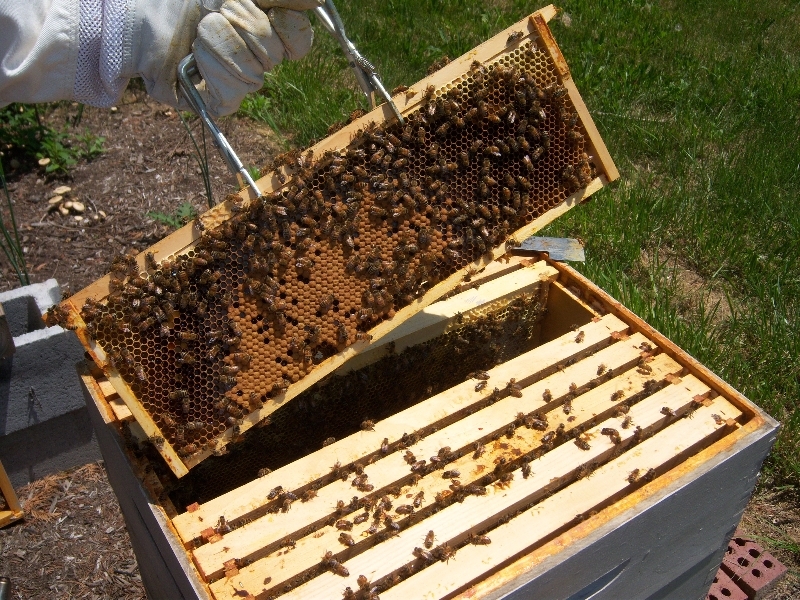 The bees are eating up (or simply transporting) the honey out of the frames very quickly. 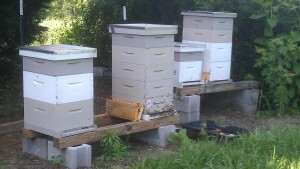 As you can see in the picture, I have simply put the frames next to the hives. The advantages are that it is nearby and no animals have made off with them. The possible disadvantage is that this might spur some kind of robbing between the hives. I don’t think this has occurred but I’m not certain. 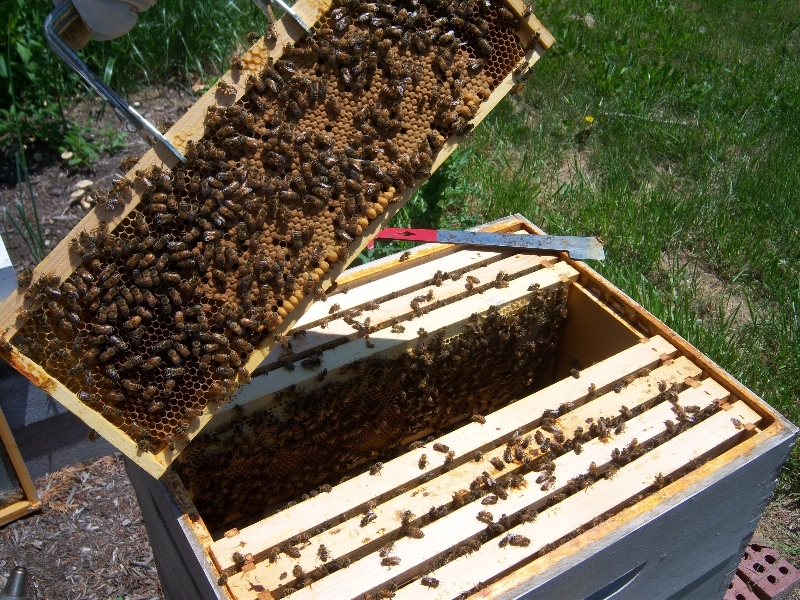 About a month ago I tried to offer up an old slightly damaged deep frame of partially capped honey to the bees by putting the frame in a plastic bin about 20 feet away from the hives. 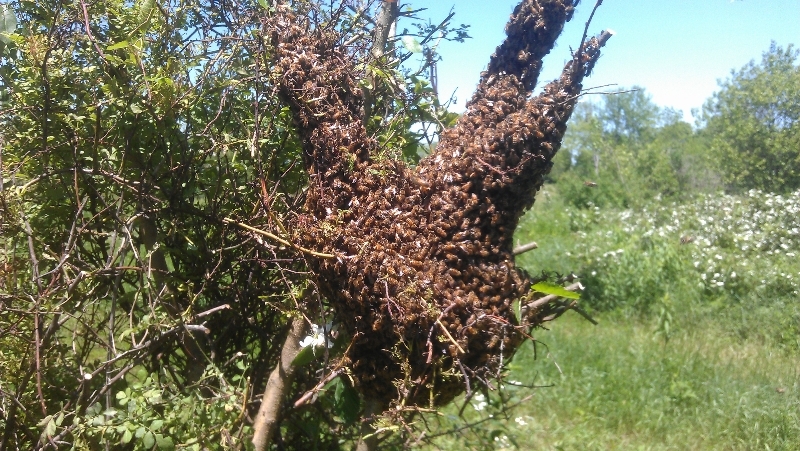 The bees didn’t really take to it at that time, possibly because the Black locust was in bloom. After about a week or 10 days, I found that the entire frame was gone. I assume that it was dragged away by some animal. I knew it was a risk, but I waited another week or so and then tried this a second time putting the medium frames right next to the hives. So far, so good. I have a few more frames that I will try to ‘recycle’ like this and then I will probably freeze the frames before reintroducing them as empty supers. It’s a little late at this point to put on an empty super, but I’ll give it a try anyway. Wow, are those ducklings growing fast. They are just over four weeks old now and we have to look twice to know who is the momma duck! I think it is almost time to try to reintegrate the Deuce with the family. We’re not sure how that will go, but I guess we’ll find out soon. In the morning the first order of business is to let the dogs out. It looked like we were going to get a beautiful Sunday to work in the yard. I went to the chicken palace and let the birds out and gave them some scratch. We still have two roosters in with the 17 hens and five guineas. The two roosters continue to get along pretty well. Every once in a while there is a little scirmish, but generally they give each other some space. Big Red is clearly the boss rooster, but Duran can hold his own. We have two broody hens: Daisy, who has been in a nest box for at least two week might be ready to give it up soon, and the larger of the two Barred Rocks who has been in a box for about a week. This is a little bit frustrating, because if we had the Maran rooster and hens in the nursery coop like we wanted, then we could give those eggs to one of the broody hens to raise. The ducks had another idea. Maybe in a couple more weeks we can start the process of raising some pure marans birds. I opened the original coop to let out those 14 hens and Freddie. These are our four year old birds and the one we handled the most and therefore the most friendly. Tilda and Gertie and Gladys are particularly nice hens. These girls are still laying very well. We’re not sure how long they will keep it up, but so far they are doing great. We had three yards of mulch delivered a couple of days ago and yesterday we continued to weed and clear out some areas so we could spread the mulch. We are having a party next Saturday, so we were working around the deck. 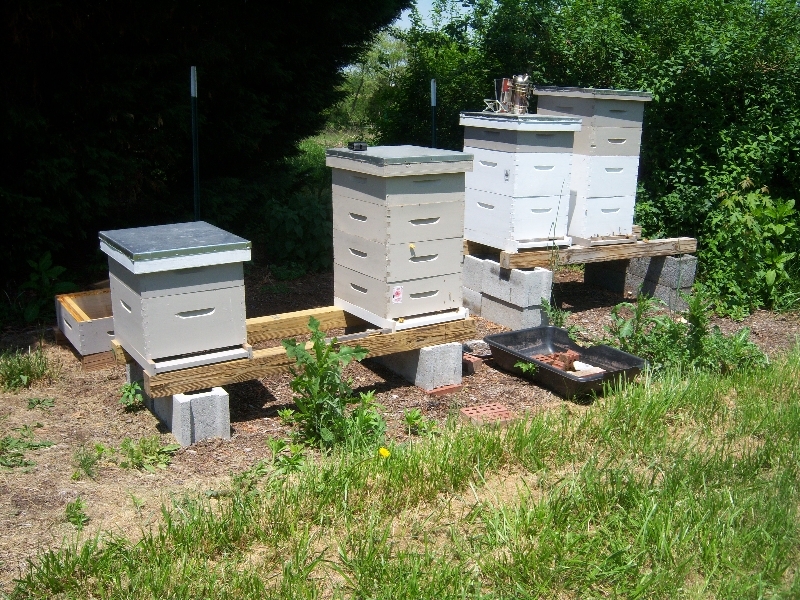 We mulched around the new barrel planters and planted some hens and chicks along the cinder block border that leads to the bees. I was also preparing the garden in order to plant the asparagus that we bought. I never got the tiller running this year, so I was doing all the digging by hand. We were just about finished with the mulching in that area when Joni yelled for me to look at the bees. They had just started to swarm! I had my phone which was miraculously charged and was able to get some video. We had never seen the swarming process from start to finish. 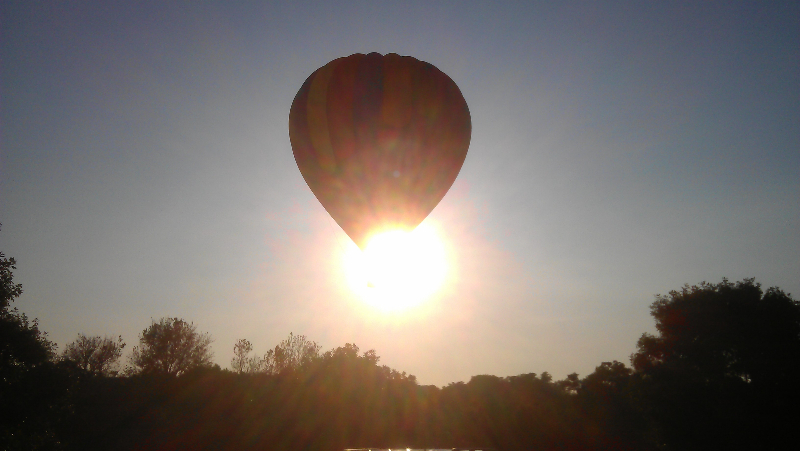 It only took about 15 minutes, but it was pretty cool to watch. 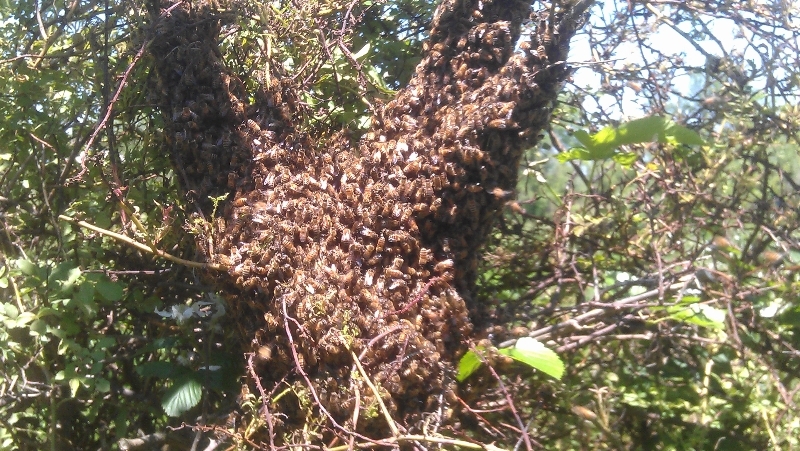 They came out of the hive and swirled up and out in front of the hive and formed a large ‘cloud’ of bees. I got some video from several vantage points. It was spectacular. 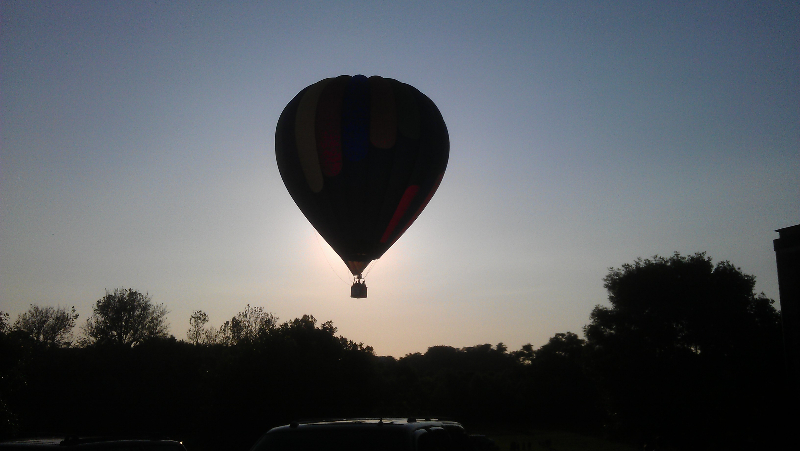 I suppose their landing spot was never in doubt, but I was watching so I would know where they gathered. Naturally, it was the ‘regular’ spot. 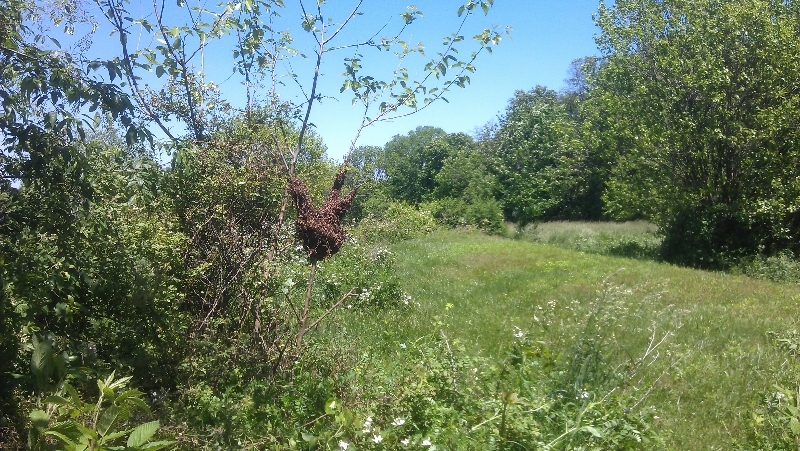 It was the same small tree and wild raspberry tangle that all five swarms from last year had used. I really should sell little cuttings or seedling of my magic bee-magnet tree. It clearly has magical powers. 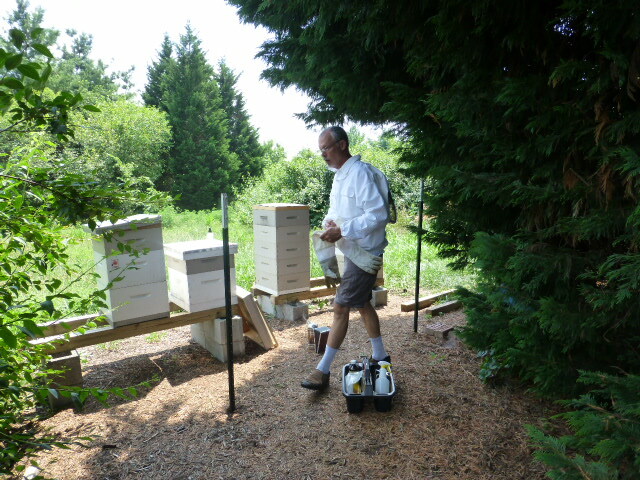 I let them settle for about a half hour and when I went back to the hives, it looked like business as usual. If I hadn’t seen the swarm, I might have never even noticed. The swarm was very quiet. 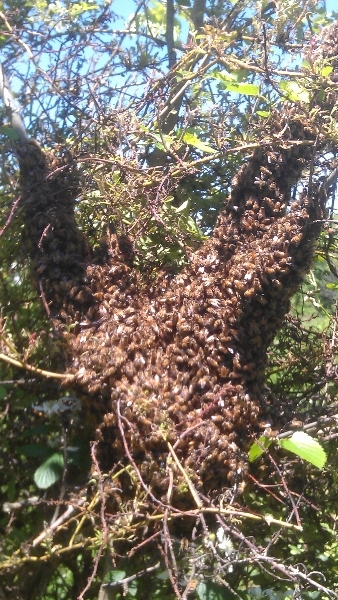 The bees were still settling down and it didn’t look like the scouts were out in large numbers yet. It was also hidden pretty well in the shrubbery. 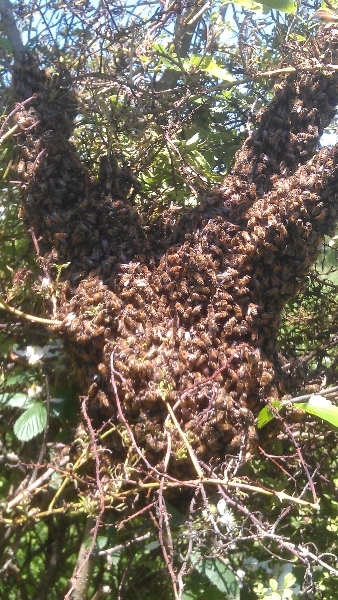 I had to cut away a lot of the brambles to expose the swarm, but once I did that, it looked like it would be an easy operation. 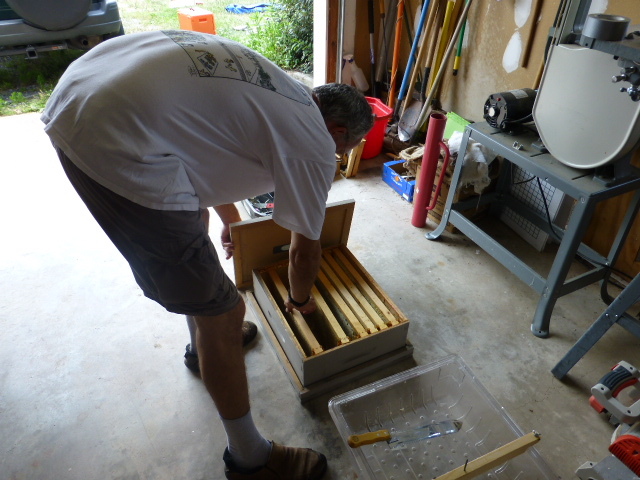 With Joni’s help, we cut the branch from the tree and carried it over to the empty hive box already set up and ready for bees. 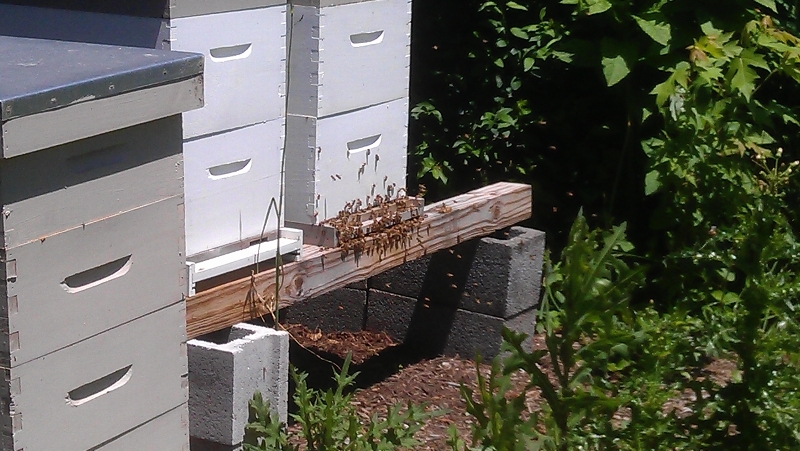 One shake was all it took, and the bees were in the box – and all over the outside as well. 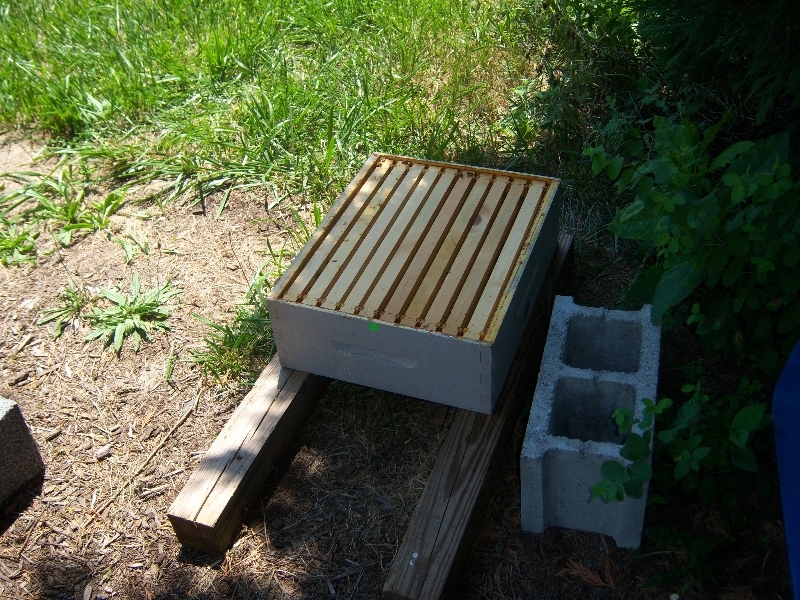 I didn’t want to use smoke to get them to retreat into the box because the bees need to spread the queen’s scent to pull the bees in. I was pretty sure the queen was in the box, so I tried to brush the bees away from the top and was able to get an inner cover on the box. 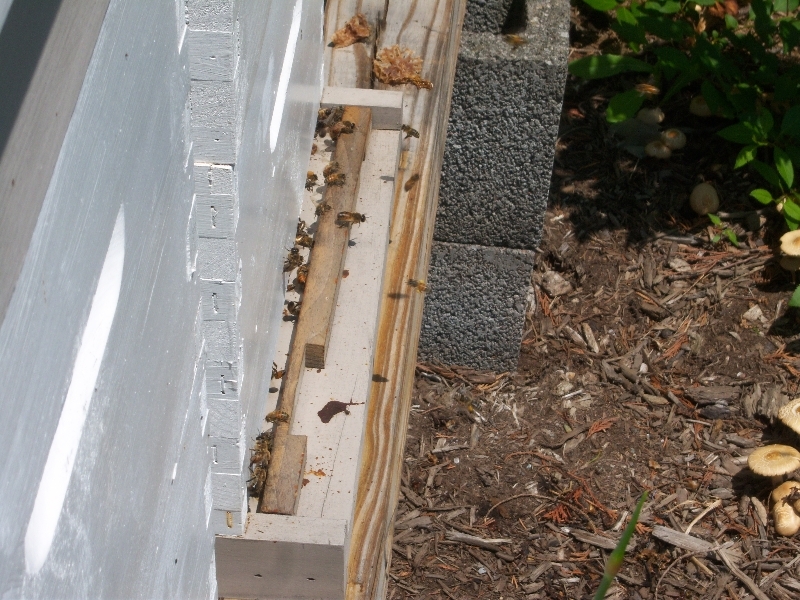 In short order, it was clear that bees were heading in through the front entrance, so the job was almost done. Last year, I think I had a newly installed swarm reswarm after a few weeks, so this time I wanted to be sure the bees had plenty of space. I decided to put a second deep on right away. 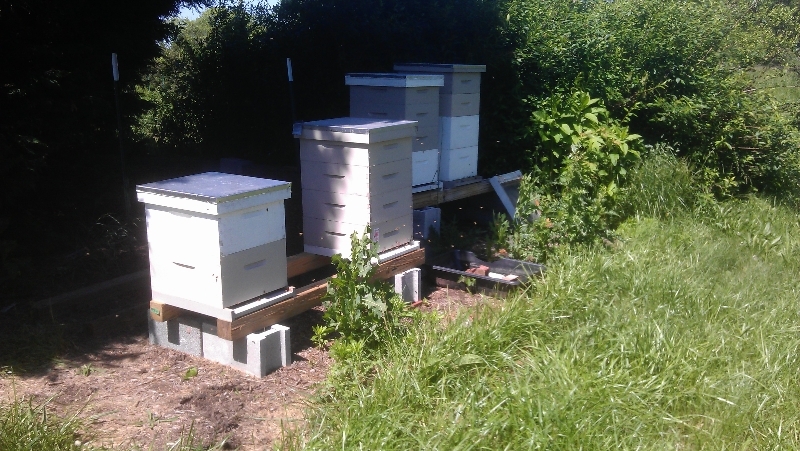 Another difference from last year is that these boxes already had frames with comb and perhaps even some old honey or almost honey that went through the winter. There is some risk that there could be some wax moths in these frames, so I will keep a close eye out for them. 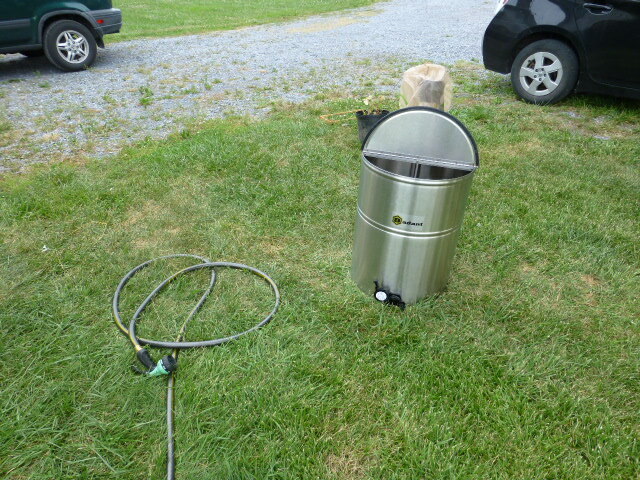 In the meantime, I will take some other frames and put them in the freezer to kill any wax moths that might be hiding. 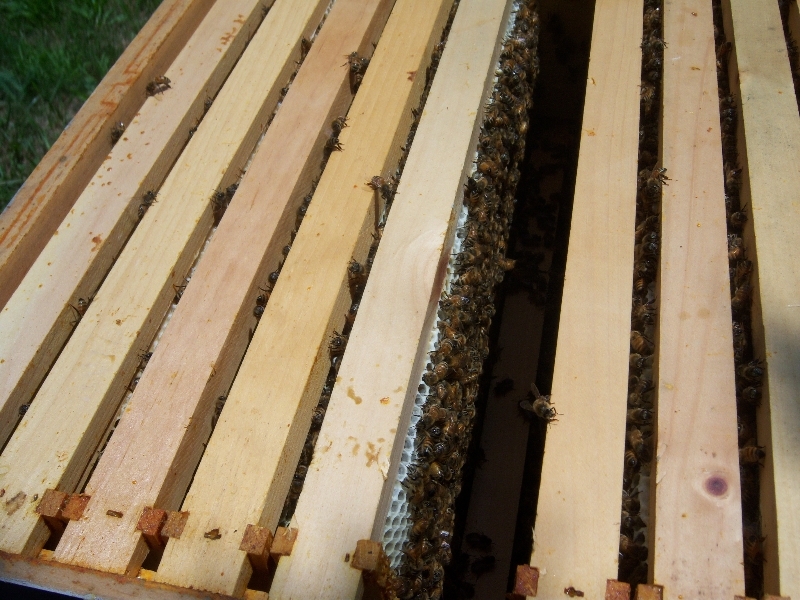 I still have five or six deep frames from my hive #2 that went through the winter with capped honey in them. I thing the best course of action is to try to feed these back to the bees, so I will try a couple of different things toward this end. 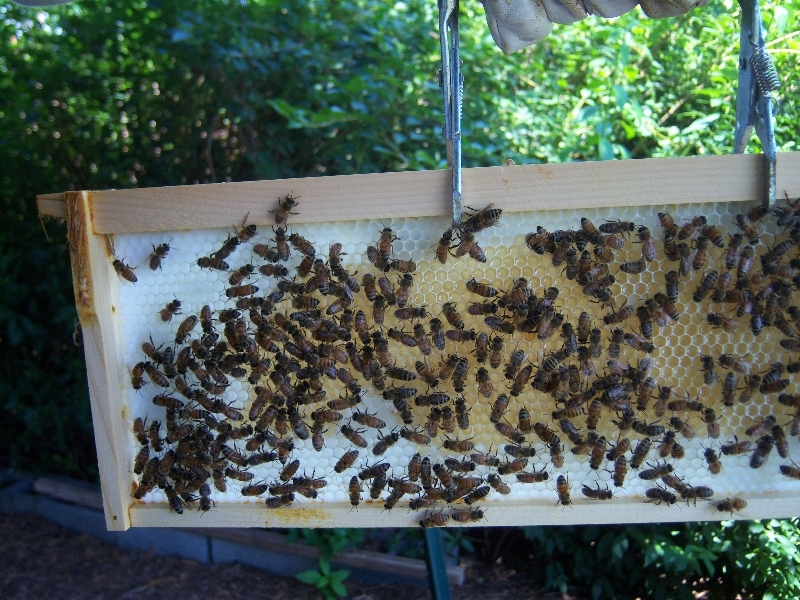 Today I will simply scratch open one frame of capped honey onto a cookie sheet to see if the bees will go after that. I suspect they will, but if not maybe either the honey is ‘bad’ in some way or maybe they are still foraging (and preferring) the nectar they are finding in the neighborhood. Dee Dee hatched 10 of her 13 eggs two weeks ago and we felt the need to move them to the nursery coop for protection against snakes. So, unfortunately, the nursery coop is being occupied for another couple of weeks. They have really grown and are very cute. Dee Dee is very protective and generally won’t let us near her babies, but yesterday we wanted to see if they would come out of the coop and take their first swim. We filled a tub with water and with a little help all but one made it into the water. Momma let the way. Normally, duck would like to be swimming a lot, certainly a portion of every day, but Dee Dee has been sitting on her nest for a month and now taking care of little ones with not swimming available – until yesterday. It was clear that she was enjoying the bath. There was a sad moment in the day, too. We knew that a pair of bluebirds had made a nest in a nest box that has been in the yard for several years. We have watched one or two sets of eggs hatch from that box each year. I had seen eggs in the box a few weeks ago and I thought we would take a look to see if the babies had hatched. When we looked in the box we found three tiny dead baby bluebirds. They looked to me to be less than a week old. There was no sign of mommy or daddy bird. Bluebirds are capable of raising young even if one parent dies. Either parent can do the job. This is especially sad and perplexing. Something must have happened to both parents. And two of the eggs or babies were missing as well. We have a snake guard on the pole, so we don’t think it was a snake, but we just don’t know what happened. The Black Locust trees are still in full bloom and the bees should be bringing in nectar and making capped cells of honey at a frenetic pace. 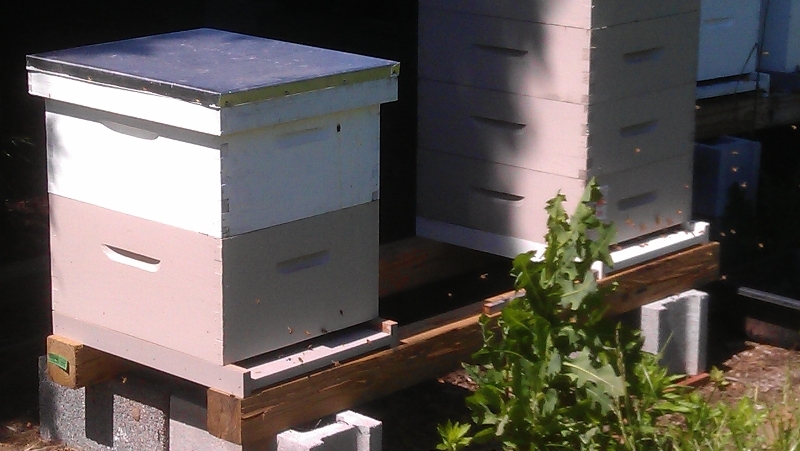 I will do an inspection on the next sunny day and with luck I might be able to add a second honey super to hive #1. I see lots of pollen arriving with the bees, so I am optimistic. I didn’t lose any bees to swarming (yet), so I have the largest population ever going into May. The new hive seems to be doing well. I still think I would like to replace the queen later in the summer if I can get a mated queen. I’m not sure of the mating success rate in late summer. Are there still sufficient numbers of drones around? I don’t know. 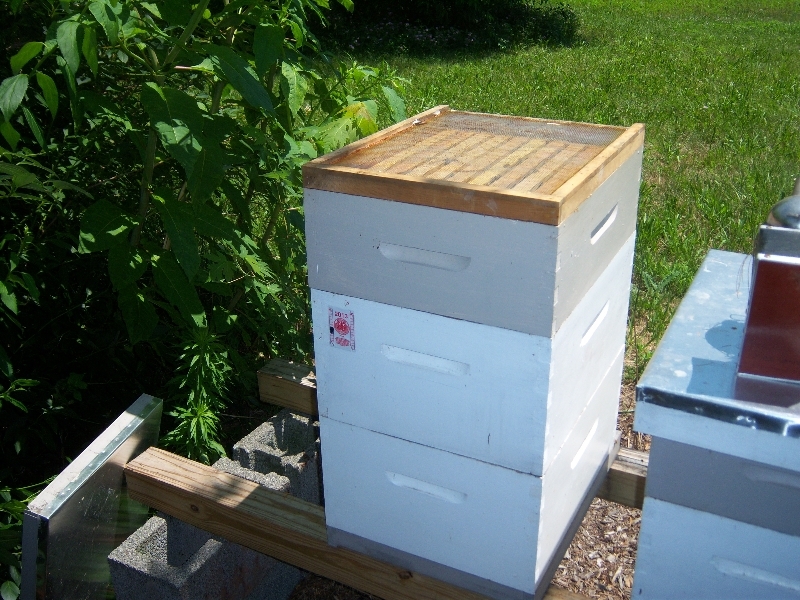 This hive has three medium brood boxes with a honey super. 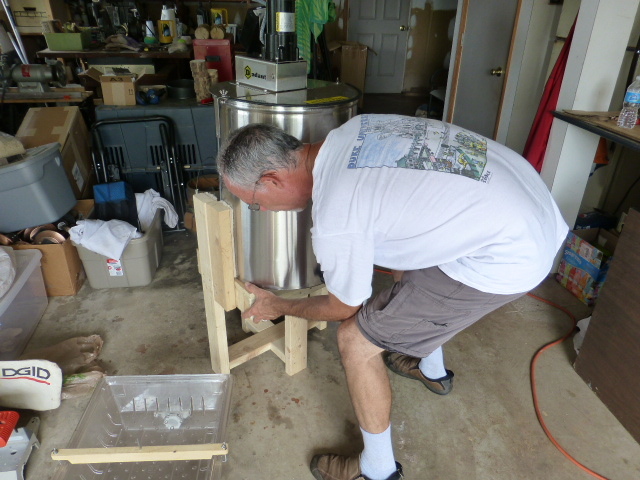 I don’t expect to get as much honey, but I am hoping for a few frames for extraction. The baby ducklings were born this past weekend, 5/10 – 5/11. We had to leave for Delaware in the morning, so we only saw the first four and didn’t really know how many of the 13 eggs would hatch. In fact, I was actually pretty worried that Dee Dee was sitting on too many eggs to be able to hatch them all and therefore thought that it might put them all at risk. Of course, nature knows better, and 10 of the 13 eventually hatched which was a pretty good yield. I guess Dee Dee knew what she was doing. We kept her separate from Deuce (her boyfriend) and she managed just fine while we were away. Yesterday we moved Dee Dee and her babies into the nursery coop where they are relatively safe from snakes or other predators. They will stay there for several weeks until they are big enough to be safe from hungry snakes. We will probably move them back to the duck area to free up the nursery coop. We still want to breed some Marans this year.